What do Nengone, George Selwyn and Sir George Grey have in common? Maré is a small island about one hundred kilometres northeast of Noumea. It was previously known as Nengone and has a population of around 6,900 people. It is part of the Loyalty Islands archipelago, which was annexed by France in 1864 and is now part of the French territory of New Caledonia. George Selwyn (1809-1878), the first Anglican Bishop of New Zealand visited Nengone in 1849. When he returned to New Zealand, he took some people from Nengone back with him to Auckland for religious instruction. In June 1852, he established a mission on the island under the supervision of the Reverend William Nihil. The mission was located at the sheltered cove of Netche (or Neche) on the northern coastline. Nihill was a hard worked and learned the local language and began translating religious texts. Unfortunately he was already ill with tuberculosis when he settled in Nengone. He died at Netche in April 1855. Sir George Grey (1812-1898) shared Nihill's interest in the Nengone language. Among Grey's manuscripts in the Sir George Grey Special Collection at Central City Library, there is a large notebook in which he compiled an alphabetical list of Nengone words with their English meanings. He also owned translations of the New Testament and the Psalms into Nengone printed by the London Missionary Society. You can view the holdings through the Auckland Libraries online Classic Catalogue and through the Manuscripts Online database (for the database, enter the term Nengone into the search box). In September 1854, after his appointment as Governor of Cape Colony, Grey donated a large collection of drawings and paintings of New Zealand and the Pacific islands to the British Museum. 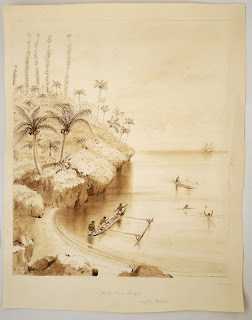 They included ink and wash sketches of Netche Cove and its inhabitants by the New Zealand-based artist Charles Heaphy (1820-1881). Although these sketches are not dated, a reference in one of Heaphy's captions to the 'residence of the Rev. Mr. Nihill' at Netche indicates that they could not have been drawn before June 1852. Grey held on to a small number of paintings and drawings and took them with him to Cape Town. Among them was the Heaphy sketch shown here. It was returned to Auckland by the National Library of South Africa in 1998. Nihill remarked in one of his journals (now in the Sir George Grey Special Collection), that the canoes from Nengone (shown in the sketch above) "are not large enough or seaworthy enough to allow them to from one island to another, except when they are very near, as are Mare and Lifu. They go away with a fair wind, and if they are not lost at sea, are obliged to wait, sometimes for several months, till the wind shifts and allows them to return".